May you be magnified, O Lord, by the revered memory of your saints Cosmas and Damian,for with providence beyond words, you have conferred on them everlasting glory and on us, your unfailing help. Mother Church commemorates twin brothers, Saints Cosmas and Damian born in Arabia. Eminent for their practice of medicine and reputation for giving free medical care; hence being known as the “moneyless ones.” The practice of charity and service to their neighbor exemplified that it is possible to live the gospel, especially Matthew 25. They attracted many converts to the faith. The holy brothers were arrested and beheaded during the Diocletian persecution in 303. 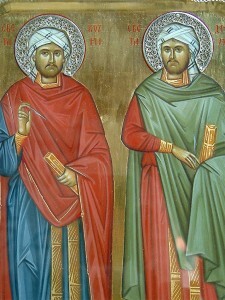 Saints Cosmas and Damian are patron saints of physicians and pharmacists. By the 6th century, their names were placed in the canon of the Mass (Eucharistic Prayer I). Church history keeps their memory alive by the fact that we observe a feast day for them and that the faithful erected church on the site of their burial place — later enlarged by the emperor Justinian; likewise a famous basilica was erected in their honor in Constantinople. Recall that Saint Francis of Assisi rebuilt the dilapidated San Damiano chapel outside Assisi.